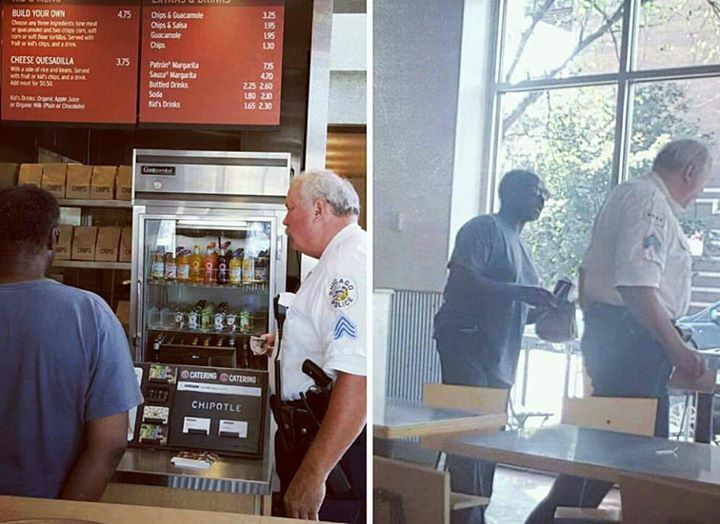 In widely seen photos first published on the popular social media web site Facebook, a Chicago policeman is shown helping a homeless man at a Chipotle in Lakeview. The photos show Sergeant B. Hagarty buying lunch for a homeless man who had been digging through the garbage outside the restaurant. The officer noticed the man, tapped on the window, and beckoned for the man to come over. He then asked the homeless man if he was hungry. When the man said yes, Sgt. Hagarty invited him to come inside. 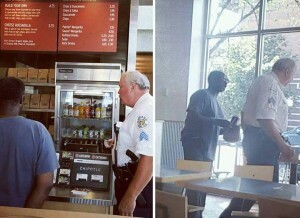 The kind policeman then purchased a meal for the man, shook hands with him, and then left. The Chicago Police Department put the picture up on its Facebook page. In a short while the page received more than 16,000 “likes” and was shared more than 6,000 times. The CPD offered praise to Hagarty, explaining that his behavior should be a role model for others. Hagarty is planning on retiring from the CPD at the end of this year, after 35 years of service.